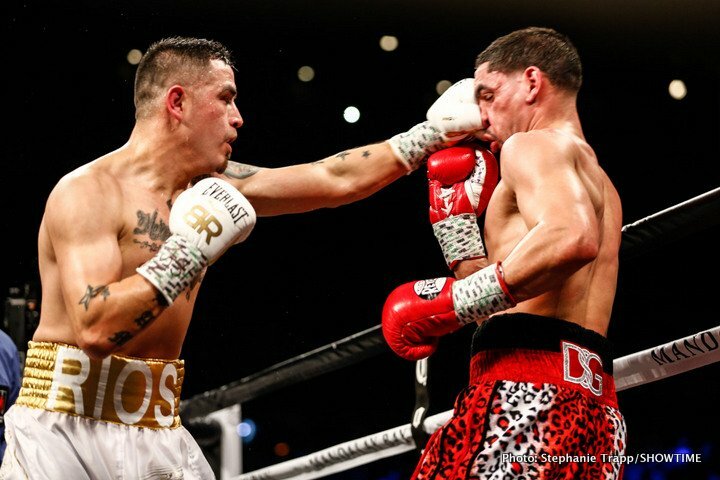 By Mike Smith: Brandon Rios has inked a multi-fight deal with Matchroom Boxing USA/DAZN and will be fighting for the first time with them on November 17 against Ramon ‘Inocente’ Alvarez at the Kansas Star Arena, Mulvane. Rios still has a lot of punching power going for him, as we saw in the problems he gave Danny Garcia in his last fight in February. Still, Rios’ hand speed is slow, and he’s too easy to hit for him to be matched against any of the top welterweights. This is another one of Matchroom promoter Eddie Hearn’ signings of a past his prime fighter. Hearn has taken a lot of criticism from boxing fan for signing a lot of American fighters that have seen better days in their career. Rios, a former WBA lightweight champion, fits in perfectly for the type of guys that Hearn has been signing. Hearn sees this as competition with his Matchroom Boxing USA company and the other promoters in the U.S. Having said that, the guys that Hearn has been signing are not on their ways to super stardom unfortunately. Some boxing fans think Rios is punch drunk, and they’ve been saying that for many years. Rios used to take pride in the wars that he had, but the punishment that he took in his losses to Mike Alvarado, Manny Pacquiao, Danny Garcia and Tim Bradley was bad. Hearn is obviously focusing on getting the casual boxing fans interested in subscribing to his DAZN platform by focusing on signing recognizable fighters like Rios, Jessie Vargas and Demetrius Andrade. Rios has suffered four losses in his last seven fights in the last five years. That many defeats suggests that Rios is no longer relevant at 147, and he can’t be counted on to win the tough fights against the top contenders. Hearn’s decision to match Rios against Ramon Alvarez, one of superstar Saul Canelo Alvarez’s brothers, gives him a good chance of winning. Ramon doesn’t possess the talent that Canelo has going for him. Although Ramon looks a lot like Canelo, he’s not fast, powerful or as talented as him. Adding Rios to DAZN gives Hearn another puzzle piece that he can mix and match with other fighters in his stable. Rios obviously would love to defeat Ramon Alvarez and then hope that Canelo would want to face him to avenge his brother’s loss. That’s not going to happen. Canelo isn’t likely going to go looking to take low level fights just to avenge all the guys that defeat his brother. Rios has his window as a world champion back in 2011 when he held the World Boxing Association 135 lb title from for a 10 month period from February to December. Since then, Rios has been a contender at 140 and 147, and he’s struggled with weight problems and being consistent. In addition to the 32-year-old Rios singing with Matchroom Boxing, amateur prospect Alexis Espino and women’s champion Amanda Serrano have also signed with them.